In warmer regions, during the month of April, unearth BD500, chamomile, dandelion and oak bark preparations. Make yarrow, bladder and BD501 preparations. During May and June, collect chamomile, dandelion flowers and stinging nettle to prepare for making autumn preparations. Collect valerian flowers on flower days usually during July in order to make BD507 preparations. Spray BD507 on compost at the time it is to be applied to fields to enhance the release of phosphorus, thereby encouraging plant growth. Dry yarrow flowers in late summer for making BD502 the following spring. During September, collect cow horns and other ingredients for making BD preparations. During October, prepare to make Horn Manure preparation as well as chamomile, dandelion, oak bark and stinging nettle preparations. Bury yarrow and bladder preparations. Unearth stinging nettle preparation and BD501. Whenever there is a descending Full Moon combined with a lunar perigee (Moon closest to Earth), spray atmospheric preparations on fruiting vegetables and trees to compensate watery forces. To deter fungal growth in wet weather, consider spraying fresh Equisetum tea (BD508). At the beginning of the plant’s growth and just before harvest, apply BD500 during a descending Moon around sunset when the soil is still warm. Apply BD501 during an ascending moon around sunrise at the beginning of the plant’s growth and just before harvest. Also apply BD501 at sunrise when the Moon is conjunct Saturn to minimize fungal attacks and improve quality. Spray BD508 just prior to a Full Moon in perigee as a fungal control. These lunar conditions are stressful times which bring watery influences to Earth leading to fungal attacks, especially in warm weather. Descending lunar periods encourage an increased vitality within the soil making it appropriate for activities like the spraying of BD500 preparation and for making compost. The best times for burning skins used in peppering is when Venus is in Scorpio and behind the Sun in an superior conjunction. This alignment may only occur every two years. 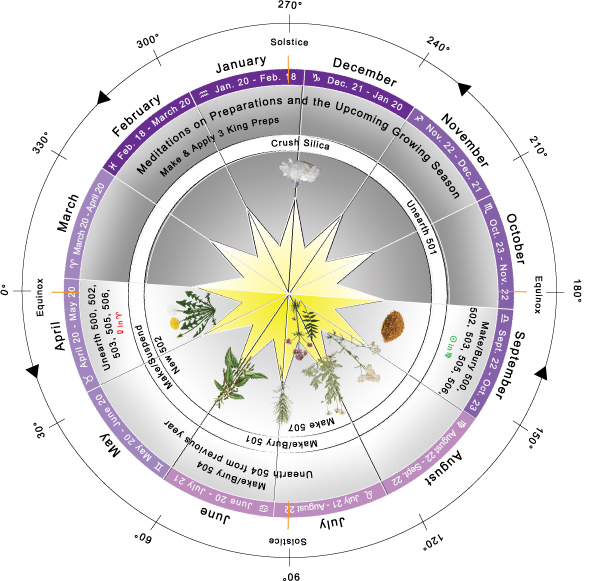 Make and apply the Three King’s Preparation during the first week of January. From mid-January to mid-February, the mineral world becomes very receptive to crystallizing forces coming in from the Cosmos via the outer planets—Mars, Jupiter and Saturn. Rays of energy are received by Earth, releasing forces important for plant growth which, during the rest of the year is bound up in the rocks and minerals.― R. Steiner.